Woman standing in the rain with an umbrella. Grab your rain hats, boots and umbrellas out of the closet. 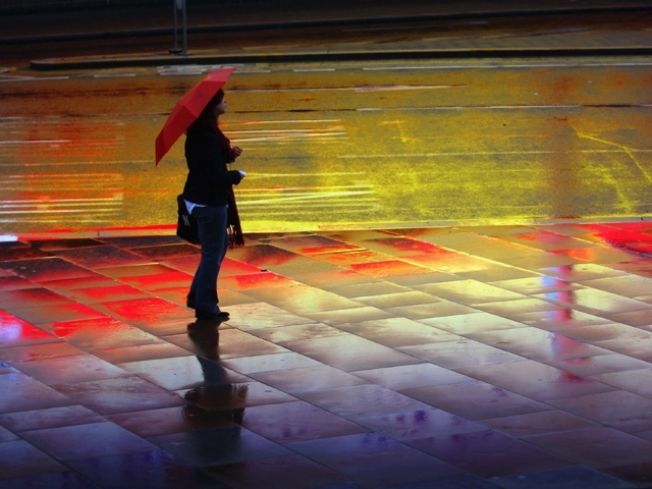 There is rain the forecast and it could put a dampener on your weekend plans. An intense low-pressure system is diving south out of the Northwest. It will enhance the onshore flow and bring us a thicker marine layer on Friday along with cooler temperatures and breezy conditions. On Saturday, we could be waking up to showers or it may hold off until early afternoon. Regardless, late Saturday is looking pretty soggy with periods of steady rainfall overnight, tapering off to showers early Sunday. We should get a break for Sunday afternoon with a colder wave moving through overnight into Monday morning. This system not only has the potential of bringing some decent rain to much of the County but also a little snow to the tops of Laguna and Palomar Mountains. The County Department of Public Works reminds people in unincorporated areas that they can get free sandbags to protect their homes, neighborhoods and streets from becoming damaged by mud, flooding and soil runoff. Valley Center, CAL FIRE Station 73: 28205 N. Lake Wohlford Road. Valley Center, CAL FIRE Station 70: 16971 Highway 76. Julian, CAL FIRE Station 50: 1587 Highway 78. Alpine Fire Protection District, Station 17: 1364 Tavern Road. Ramona, CAL FIRE Mount Woodson Station: 16310 Highway 67. Fallbrook, North County Fire Protection District, Station 4: 4375 Pala Mesa Drive. Dulzura, CAL FIRE Station 30: 17304 Highway 94.